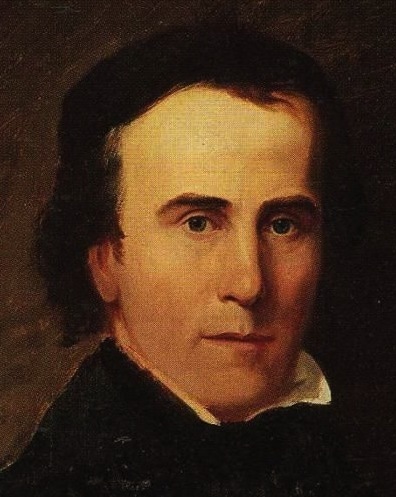 Today in Masonic History Thomas Cole passed away in 1848. Thomas Cole was a British-born American artist. Cole was born in Bolton, Lancashire, England on February 1st, 1801. In 1818 his family emigrated to the United States, initially living in Steubenville, Ohio. It was there that Cole learned the rudiments of his profession from a wandering portrait painter. He had little success with portraits and shifted to landscapes. In 1823, Cole moved to Pittsburgh. The following year he moved to Philadelphia and eventually rejoined his family after they had moved to New York City. In 1826, he helped to found the National Academy of Design in New York City. In New York City, Cole was able to sell five of his landscapes. His patron financed a trip for Cole to go to the Hudson Valley where he produced a variety of paintings including Views of Coldsprings, the Catskill Mountain House and Kaaterskill Falls a two drop waterfall in the Catskill mountains. When Cole returned to New York City he was able to sell all of his paintings. One of the purchasers lent his paintings to the American Academy of Fine Arts annual exhibition. This brought attention to Cole from some of the big names in the art world at the time. It also helped him to gain new patrons. Although most of Cole's work was landscape, he also did allegorical works as well. This included a multi-piece worked called The Course of an Empire which started with a painting of an untouched field and ended with the same field with the ruins of a city on it. He also did works that were biblical in nature including a variety of paintings about the Garden of Eden. In two periods, Cole spent his time abroad in Europe. He traveled around studying the works of the old masters and painting the landscapes of Europe. Cole passed away on February 11th, 1848. Cole was a member of Amity Lodge No. 5, Zanesville, Ohio.